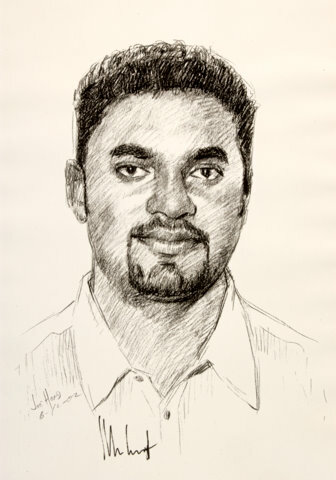 Mandheep Dhillon Muralitharan, best known as “Murali,” has been a cricketing-weapon extraordinary for some time and, as such, is a national icon in Sri Lanka. His survival in the frontlines of cricket has faced three major challenges. In effect, he has been subject to “triple jeopardy” in the ‘courts of cricket’, something unprecedented in international law. The first massive effort to get rid of him on charges of being an illegal “chucker’ was in 1995-96; while the second was in early 1998 Oval (see especially Whimpress 2006: 305-13 for detailed accounts). Both were Australian-led. 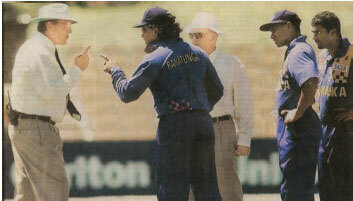 On both occasions the Sri Lankan authorities (led by Dharmadasa and Sumathipala respectively) stood firm; while Arjuna Ranatunga stood out on the second occasion because the resistance was played out in front of a huge crowd at Adelaide (among them this author). JOE HOAD has two signed IMAGES of MURALI for sale, both originals. Neither is framed at the moment and we consider it advisable for the Buyer to undertake this task to his/her taste. We expect a decent sum for each. The money is for JOE who is now in the twilight of his career and in greater need than either Murali or most of us. 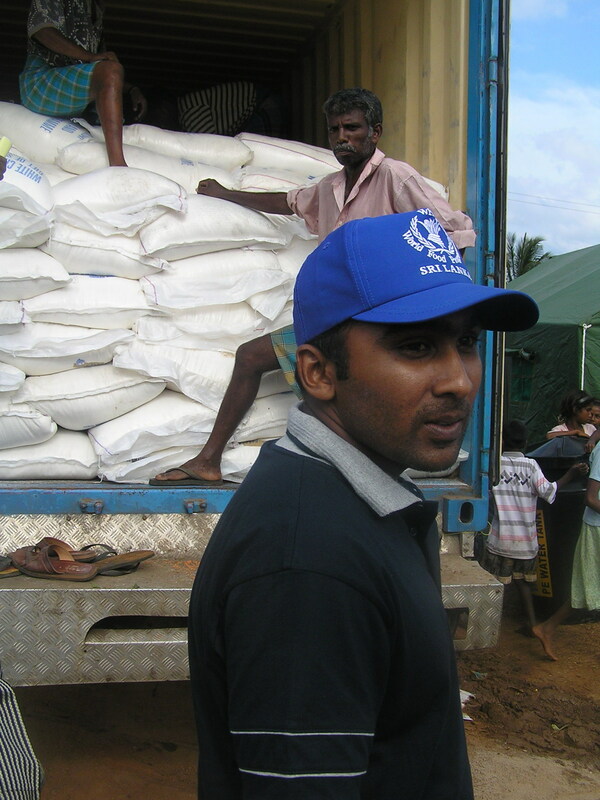 On 12 February 2008 as the Sri Lankan and Indian cricketers were preparing to engage in battle at the Manuka Oval in Canberra a ‘swarm’ of red-shirted Tamils descended on the grounds. 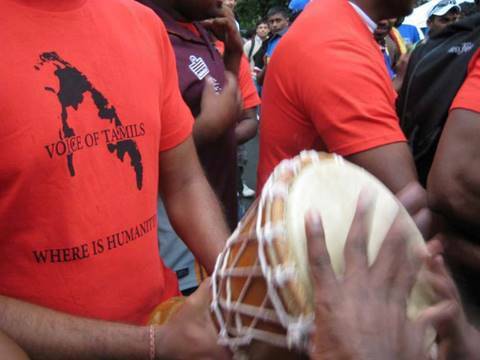 These personnel all wore matching shirts with the words “Where is Humanity” and “Voice of Tamils.” These were second-generation Tamils and 160 had travelled up from Sydney to join local Tamils from Canberra and a few who had journeyed from Melbourne to express their political sentiments while enjoying the match. 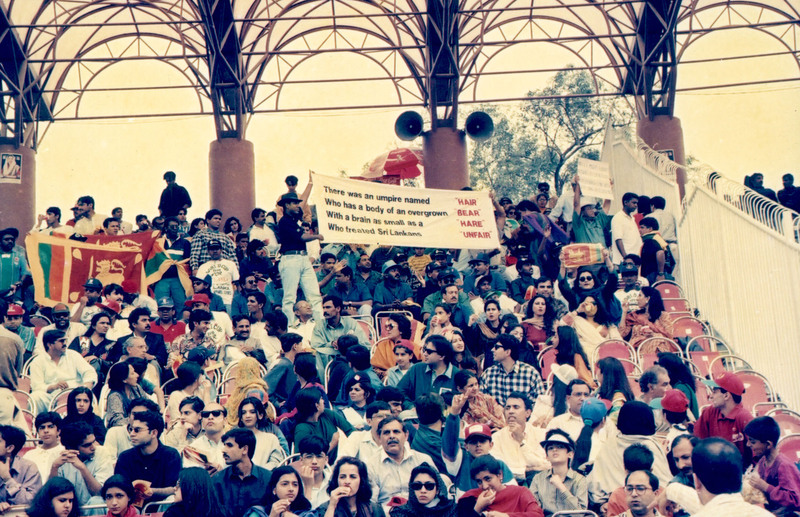 They were stopped at the gate and had to negotiate their entry; it would seem that two were denied entry and that they dispensed with banners and “agreed not to fly “Tamil flags.”  Once inside they assembled near the scoreboard, a vantage point that maximised the attention they would secure. There they proceeded to bajau in the Sri Lankan manner born, that is, to make merry with song and dance to the beat of drums, while spicing bodily enthusiasm with shout. 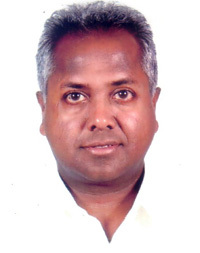 The ‘Mail Online’ the official website of the United Kingdom newspaper ‘Daily Mail’, the UK’s second biggest-selling daily newspaper after ‘The Sun’, has chosen the 1996 World Cup winning Sri Lanka team of Arjuna Ranatunga as the third in the Top 50 Most Entertaining Teams in History. ‘Daily Mail’ is published by Associated Newspapers Ltd. and edited by Paul Dacre. The above Top 50 list published in the ‘Mail Online’ website on April 2 has been picked by Tom Bellwood. In its introductory remark, the website says: “What is more important: playing with style or winning at any cost?… As the artists of Arsenal and Barcelona face off in the Champions League quarter-final, Sportsmail celebrates the great sporting teams who put aestheticism above efficiency. Copy of Photo in possession of Michael Roberts. Also see his Essaying Cricket (Colombo: Yapa, 2006). Mahela Jayawardene may have scored a few centuries in his lifetime but the innings of 110 against Kolkata Knight Riders in that maelstrom of frenetic spectator activity, Eden Gardens, has a double message for Ashantha de Mel’s selection coterie. 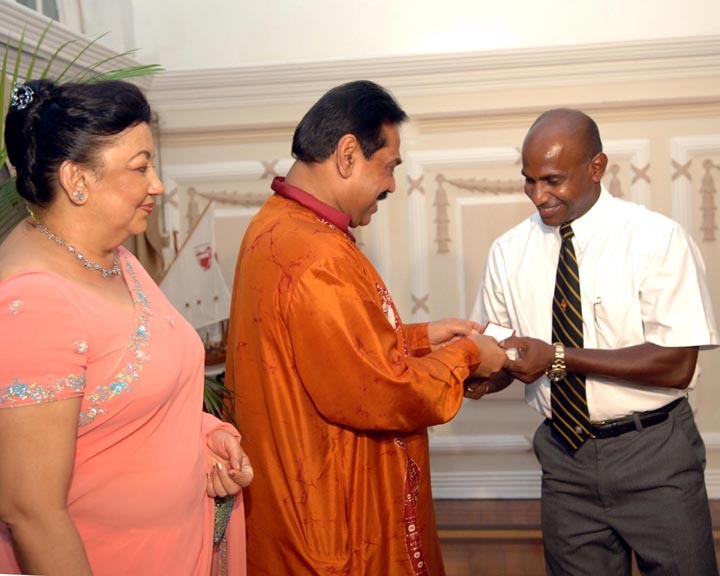 To Jayasuriya, or not Jayasuriya? When Sanath Jayasuriya burst unto the international cricketing scene in 1996 as an explosive opening batsman , he presented major problems for opposing opening bowlers. 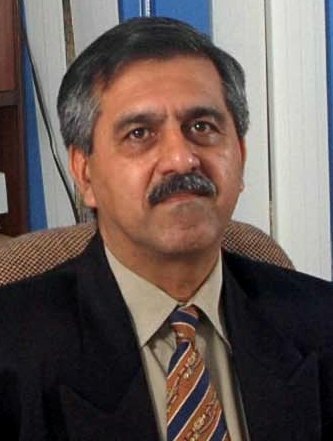 More recently he has been presenting problems to the Sri Lankan cricket selectors and Lankan cricket buffs. Jayasuriya is now everyone’s dilemma. To coin a pun out of the drama in Hamlet, “to Jayasuriya ….. or not Jayasuriya” is one of the plays of the day. This dilemma has been around for a while. 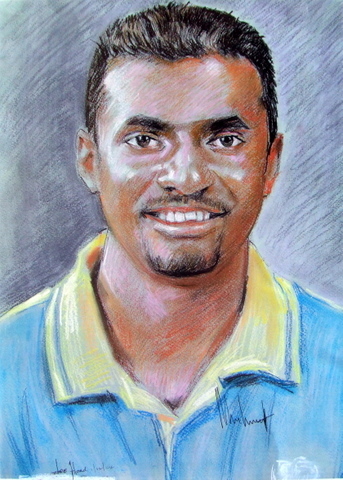 Jayasuriya, after all, was born on 30 June 2 1969 and his indifferent form in the Test arena led to his omission and subsequent re-inclusion in the touring squad to England in the summer of 2006. That issue was resolved more recently when Jayasuriya decided to concentrate on limited-overs cricket. You are currently browsing the Critiquing Cricket blog archives for April, 2010.